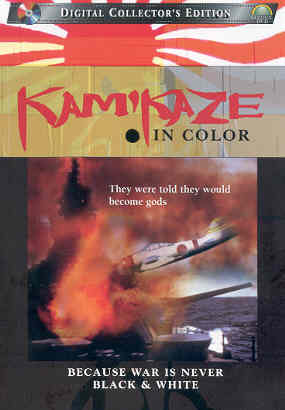 Although this DVD advertises "color," the real strength of this documentary lies in its well-written script and its quotes from American and Japanese participants in the kamikaze operations. The little color added to black-and-white film clips adds almost nothing for viewers, and the color can be distracting in a few places such as where the red and white Japanese flag is shown behind planes in black-and-white. Kamikaze in Color provides a balanced presentation of the ten-month history of kamikaze operations starting in the Philippines in October 1944. The documentary has eight chapters that cover topics such as the battles at Leyte Gulf, Iwo Jima, and Okinawa. In addition, the DVD has about two hours of special features divided into four sections: U.S. newsreels, Japanese newsreels, color bonus footage, and excerpts from Japanese movies. These special features have no introduction or commentary, and most have little or no connection to kamikaze operations. The two highlights of these special features are a Japanese newsreel showing the farewell of the five pilots in the Shikishima Unit, who made the first official kamikaze attacks, and a 90-second wartime American newsreel about kamikaze attacks on the carrier Ticonderoga and the battleship Nevada. The DVD suffers from production flaws typical with this type of historical documentary. The images at times do not match up with the narration, and some images are repeated several times. The DVD misleadingly includes several clips filmed after the end of the war, possibly so the producer could obtain additional color footage. The most annoying and historically inaccurate aspect of the film is the repeated appearances of four men dressed as pilots who enact two scenes: (1) walking on a path away from a shrine and then bowing and (2) a kamikaze farewell ceremony. This footage does not show real kamikaze pilots. Instead, these clips were part a reenactment filmed at Chofu Air Base and a nearby Shinto shrine in December 1945. Every time one country gets something, another soon has it. One country gets radar, but soon all have it. One gets a new type of engine or plane, then another gets it. But the Japs have got the kamikaze boys, and nobody else is going to get that, because nobody else is built that way. Please congratulate me. I have been given a splendid opportunity to die. . . . How I wish I could be born seven times, each time to smite the enemy. . . . I shall return in spirit and look forward to your visit at the Yasukuni Shrine. The excerpts of several letters from kamikaze pilots provide insights into their thinking before the attacks, although one may question their candor since their letters were subjected to military censorship and since the young men had intense social pressure from peers and others in Japanese society to conform to the prevailing militaristic ideology. Although generally the documentary accurately reflects the history of Japanese kamikaze operations, a few mistakes appear in the narration. The film states that over 2,500 kamikaze pilots forfeited their lives , but this figure includes only Navy pilots. The total number of kamikaze airmen who died was nearly 4,000 if one includes Army kamikaze deaths in the figure. The narration confuses kaiten weapons (human torpedoes launched from a mother submarine) and midget submarines . The narrator incorrectly explains that midget submarines were called kaiten and included the 5-man kairyu and the 2-man koyru. Although kaiten had only one pilot, the film mistakenly refers to a kaiten's two-man crew. The documentary incorrectly explains that Takijiro Ohnishi called on the 201st Air Group for volunteers who were not family men , but the first kamikaze unit's leader, Yukio Seki, was a married man. In the description by Inoguchi and Nakajima (1958) of the formation of the first kamikaze squadrons, they do not mention that family men were excluded when volunteers were sought. This documentary's evenhanded presentation provides much information about kamikaze, but the inclusion of postwar film clips and a few mistakes in historical facts somewhat lessen the film's value. 1. The ellipses in the quotation have been determined based on the full letter printed in Inoguchi and Nakajima 1958, 200-1. 2. At 1:45 in DVD. 3. From 1:03:45 to 1:05:20 in DVD. 4. At 13:40 in DVD.